China has the highest levels of copyright piracy and trademark counterfeiting in the world, even though it also provides the highest per capita volume of enforcement. 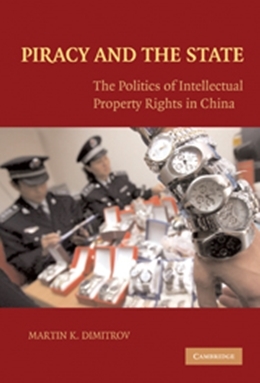 In this original study of intellectual property rights (IPR) in relation to state capacity, Dimitrov analyzes this puzzle by offering the first systematic analysis of all IPR enforcement avenues in China, across all IPR subtypes. He shows that the extremely high volume of enforcement provided for copyrights and trademarks is unfortunately of a low quality, and as such serves only to perpetuate IPR violations. In the area of patents, however, he finds a low volume of high-quality enforcement. In light of these findings, the book develops a theory of state capacity that conceptualizes the Chinese state as simultaneously weak and strong. It also demonstrates that fully rationalized enforcement of domestic and foreign IPR is emerging unevenly and, somewhat counter-intuitively, chiefly in those IPR subtypes that are least subject to domestic or foreign pressure. The book draws on extensive fieldwork in China and five other countries, as well as on 10 unique IPR enforcement datasets that exploit previously unexplored sources, including case files of private investigation firms.